Small Businesses Premises Liability Explained | Branch & DhillonBranch & Dhillon, P.C. Every small business owner knows of the dangers to their computers and other business machines when they are in the business setting. However, a loss of those items can pale in comparison to the monetary loss that can be incurred by a premises liability suit. What Can Texas Business Owners Do to Keep Property Safe? In Texas, business owners are required to keep their property free from any dangers that could harm those who visit them. The first level of liability is the ongoing maintenance of the property. If there are gaping holes in the floor, uneven areas, etc., this opens you up to a finding of negligence should anyone fall because of this lack of care. Staircases must be clearly marked, and the stairs should be even with a non-slip surface to avoid preventable accidents. Maintenance is an ongoing process that must take into account both wear and tear on the premises and the use of that space. If items fall into disrepair, they can pose hazards to the public through falls, being harmed by exposed wiring, respiratory problems from mold, etc. Regular maintenance and repairs should be taken seriously, and that work should be documented to show your efforts to take care of the property. In addition to maintaining the property, there must also be an ongoing effort to take care of any third-party problems that could cause injuries to anyone who is allowed to be on the premises. 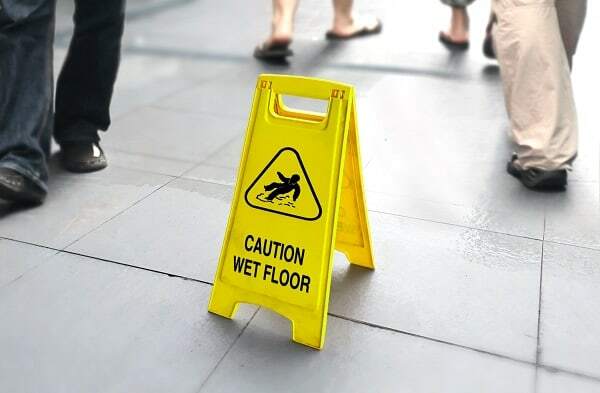 Spills on the floors, debris left in public areas and other hazards are notorious for creating a dangerous environment that leads to slips and falls. When considering how to properly maintain and secure your business, never forget about the outside areas. Uneven areas on the sidewalk or parking lot could lead to a liability case. There are also other dangers that can lurk just outside your doors. If the business sees a lot of nighttime visitors, providing plenty of outdoor security lighting can reduce potential liability from crime that occurs outside. If the area has a history of robberies, violent crime, or drug activity, having a security guard can help to reduce the threat to your customers and any claims of security negligence. The threat of sexual assault makes it necessary for lighting to be pervasive and bright around the premises. If someone were to be assaulted outside your business, you may be liable if reasonable security measures were not taken. To avoid personal injury lawsuits, having an appropriate level of security for the area and the clientele can help to limit your liability. If someone brings a personal injury or other premises liability lawsuit against you, it’s important to know your rights as well as if you are liable as the business owner. Contact us at Branch & Dhillon, P.C. to have us review your case and find out how we can help. Birth Injury or Birth Defect: When Can a Parent Sue?